After Dare’s nice score at the Fetch Gate trial over Independence Day, she’d accrued a total of 27 NEBCA points in Novice-Novice. She was qualified for the NEBCA Novice Finals in Nov-Nov, with four more trial days to go before the Novice Finals. At 30 points, she would have to move up to Pro-Novice. If she earned any points in Pro-Novice, she wouldn’t be able to run in the Novice Finals in Novice-Novice, so after days of thought, I decided to take what felt like a gamble, and moved her up to Pro-Novice for the Fetch Gate Novice and Leatherstocking trials, hopefully to earn her qualifying points at that level. She’s been able to do this level of work for YEARS, but we’ve been so inconsistent at trials that it had taken almost five trial seasons to get to the 19 points she had at the beginning of this year. Because we’ve had trouble being consistent, there seemed no point in moving her up and making things more difficult any sooner than I had to! With a few decent runs behind us this summer, and additional confidence in myself thanks to Dot, I made the leap and moved up Dare. And once done, it didn’t seem so bad. Mary Thompson was our judge for the three days of the Fetch Gate Novice trial at the end of July. The Pro-Novice classes were large all weekend. On Friday, the first day, Dare was in the 19 spot and Dot was last of 40 dogs to the post. I sent Dare out for her first P/N run, and although it wasn’t a beautiful run, I was happy with her. For the most part, she did as I asked, and earned her first point in P/N. Outrun 18, Lift 9, Fetch 4, Drive 14, and Pen 8. Total: 53. Dot went out big, but overall the shape of her outrun was good and she turned in on the sheep appropriately. We had a nice packet of sheep, I was seeing things happening and reacting with good timing. We were really together on this run, and I can barely believe it was ME at the post! Outrun 19, Lift 9, Fetch 19, Drive 17, Pen 10. Total 74 (80 possible). We won the class! I can still hardly believe it! Saturday’s class was even bigger, with 46 dogs running. Dare was about halfway through the running order, and Dot a few dogs from the end. To my very happy surprise, Dare had quite a good run, finally running in a trial as if she knew what she was doing. 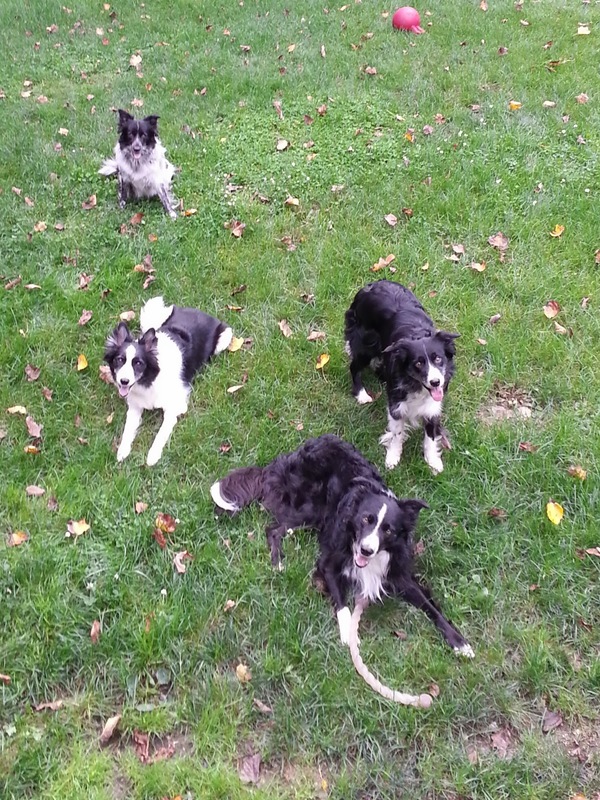 We kept more of our fetch points this time, and improved our overall score by 11 points: O 18, L 7, F 16, D 15, P 10. Total: 66, which earned us 8th place in that big class! I was SO PROUD of her! Dare turning the post in her 8th-placing run. It was only her second time running in Pro-Novice. Dot’s run on Saturday was very good, but her outrun was not as good as the day before; she went very wide to the fence, then turned in and came in flat. All else went well, and again during the run I felt that good (but not-yet-familiar) feeling of being “in the zone” as a handler of reading the sheep and really well-partnered up with my dog at a trial. The scores were O 16, L 9, F 18, D 18, P 9. Total: 70. Our 70 earned us 2nd place, which once again put me in a small place of happy disbelief. On Day 3 of the Fetch Gate Novice Trial, the weather was a bit more dicey. We were hit by a very heavy downpour on Saturday evening just about the time of the handlers’ dinner, but so far hadn’t had anything too bad during the trial itself. The number of dogs running in P/N on Sunday went back to down to 40 to the post. Dot ran about 1/3 of the way into the order, and as our turn got closer, the weather started to look like it meant business. As we walked out to the post, at the top of the hill behind the field I could see and hear a tremendous wall of rain as if a microburst was coming (fortunately without the tornadic winds!). At the bottom of the field at the post, it was just barely beginning to sprinkle when I sent Dot. And I could not help myself, seeing the deluge moving down the hill; I hurried to try to beat the rain. It was all about the timing of this downpour. If it had begun a run before me, it would have been pouring and I just would have trudged to the post in a downpour. If it had been further away and a few minutes later on arriving, I would have ignored it. But as it was, I couldn’t help myself in trying to get through the course before the rain arrived, and I ended up not being focused and rushing too much. I was very impressed with Dot; she did not get rattled or tense even though I was. She just carried on working her stock as best she could, given my bad timing and mistakes. Her outrun and lift weren’t very good and those belong to her (I may have also tried to get her to move along on the lift more quickly, but I don’t remember). The rest was mostly my fault. O 16, L 7, F 16, D 15, P 10, total 64. A 64 wasn’t good enough to place on Sunday; I think we ended up around maybe 12th or 13th. When Dare ran later in the class, the weather was not an issue. We lost ground from our nice run the day before, but I was still glad we got around the course with no major “incidents.” O 16, L 7, F 11, D 15, P 10, total 59. It’s now November as I attempt to recap Leatherstocking, which was way back on August 16th. The judge was Denise Leonard. I don’t remember all the details, but it wasn’t a very good outing. The field is large, and the course is set on the left half of the field. The left side of the field is on a somewhat steep hill, which drops away to the bottom right. The pressure is very heavy to the left as the holding pens at the top and the exhaust pens at the bottom are both on the left side. The sheep are from a flock that has been at the field before, so some or most of them are familiar with the location of the exhaust pen; at any rate, they were all very determined to get there! To the right, a swale crosses the field, and an area of long, rough grass runs along it. So, the handler needs to decide whether to send their dog left, into the pressure, possibly causing their dogs to run tight or stick, or to the right through the tall grass and hope they keep a good line. Depending on the path the dogs took, there was potential for them to lose sight of their sheep in either direction. It seemed to me that most handlers sent to the left at the Novice trial. 33 dogs went to the post in the Pro-Novice class. My first dog up was Dot, and after having done well at Fetch Gate, I was hoping we’d at least have a decent run here. I was torn between sending her left and risking her stick at the top holding the pressure of the set out pen, or sending right and risking her run out ridiculously wide to the opposite fence. A dog early in the running order did run out all the way to the right side fenceline, so I decided I’d better send Dot left and try to keep her moving if she got stuck. Her outrun was wide, but I don’t really remember the top. I’d guess probably deep enough, but turning in a bit short and coming on to them slowly. Fetch very off line and she didn’t seem to try to get around ahead of them to catch them. As I remember it, the line was basically diagonally off line till even with the post, then she pushed them straight towards me; in other words, rather than a banana fetch, it was more like two sides of a triangle. I think I recall some fiddling back and forth at the post getting the drive started (but may be confusing this part with Dare’s run). The first leg of the drive was very slow, and because the sheep were bouncing a bit back and forth and trying so hard to get around her and escape to the exhaust, I allowed them to stop and settle a bit at least twice on the drive leg. I’d forgotten that stopping was probably costing us points, although if I had thought about it, I probably would still have chosen to take the points than risk the sheep bolting back. Nevertheless, the slow progress got us in the end. I don’t recall whether we made the drive panels but based on the points, I have to think so. As I got them just to the mouth of the pen, time was called. This was such a genuine surprise to me that I thought perhaps the timer perhaps hadn’t been set properly somehow. I knew we’d lost time pushing them from the end of the fetch back up past the post, and on the first leg of the drive, but I truly felt we hadn’t used all our time. I didn’t have a watch on, and had to accept that time was called properly, and it probably had been. No doubt I was concentrating so much that I had no idea how much time had really passed! Outrun 17, Lift 9, Fetch 9, Drive 17, Time. Total: 52. Not good enough to even make 10th place. I do wish she’d done a better job of covering on the fetch line, but I was relatively pleased with how she worked for me otherwise. Dare was the last dog to run in the class. I also sent Dare to the left. She ran out, not very wide, but somewhere between a third and half way out, quite surprisingly she seemed to lose sight of the sheep and apparently had forgotten where they were. She stopped on her outrun; unusual for her. I tried to wait her out, but it was very clear to me that she had no idea where the sheep were. I helped her out with a flank whistle, which she took, and fortunately she got herself to the top. Based on her score it was a fair lift (for her). The fetch was a big banana. We fiddled around trying to push them past the post to start the drive, and she dove in and split them up, so I retired. O 15, L 8, F 8, RT. This was our last trial before the NEBCA Novice Finals, which would be in two weeks. Not quite the last tune-up I’d hoped for. The NEBCA Novice Finals were three trials over Saturday and Sunday of Labor Day weekend, with Chris Bowen as the judge. The trial was held at the Tolland County Agricultural Center in Connecticut. I’d never been there before, but it is the same field used for the Connecticut Sheep Breeders Trial in April. The field was pretty flat and not as large as some. The course was set to the right side of the field, with the left side being longer, uncut hay or grass of some sort. The holding pen was at the back fence and somewhat to the left of the set out point. The exhaust was on the right fenceline near the bottom corner. The sheep were fast and knew the where the exhaust was and would run hard from the top. If they beat the dog to the exhaust, they’d cheerfully jump the fence out of the field into the exhaust. If the dog could get them around the course, they were difficult to pen, although this seemed to improve later as handlers learned how to gently yet insistently finesse them. It seemed to me that, at least for my dogs, we got one chance to get them penned. If they broke away from the pen, there was little chance of convincing them to go in after that. The weekend was hot and extremely muggy, with a dewpoint of 73 degrees, and we considered ourselves lucky that it was overcast. Occasional breezes made things more bearable, but there wasn’t much air movement in the parking area, unfortunately. I’m writing this over two months after the fact, so as with Leatherstocking, I don’t recall some of the details of my runs. In short, they weren’t very good. We struggled a lot with the running sheep. 27 dogs went to the post in Pro-Novice. Dot was my first dog to run, and her first run was the best run of both my dogs all weekend. I sent her left on the first outrun, and she went wide. Scores for the outwork were fairly good, and the drive was pretty zig-zaggy. We got around the course to the pen, and they were in the mouth of the pen looking in, but I needed a small away flank to cover them. She went come-bye, which pushed the sheep out of the mouth of the pen, and we never had a real chance of getting them in again. Outrun 20, Lift 10, Fetch 18, Drive 16, Time. Total: 64. 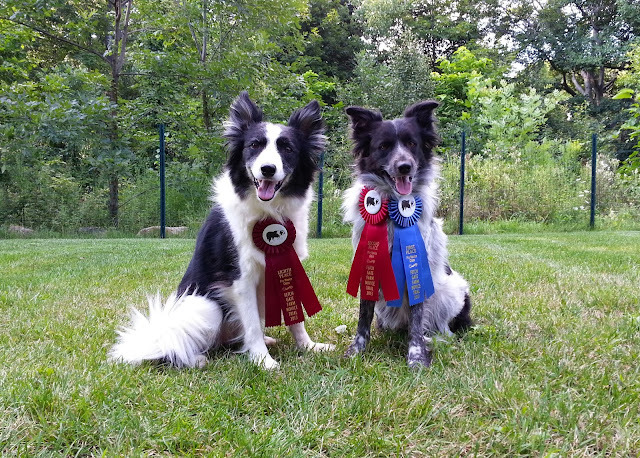 The Novice Finals does not recognize or award placements in each individual trial; only overall placements are announced, based on the total of the dog’s best two scores. This 64 put Dot at about 8th place of the first trial. Dare was near the end of the running order. I sent her to the left as well, and she went out nicely, with a 19 point outrun. The sheep immediately ran hard directly towards the exhaust. As they came down the field, Dare shifted gears and put on some extra speed, as she does when she goes into flat out chase mode. I said “thank you” and stepped away from the post, retiring from the run. I immediately realized I'd made a terrible mistake. Poor Dare was honestly attempting to speed up to cover them. I had just taken her off the sheep for being RIGHT. I felt sick over it, and admit I had a few tears with Dare as I took her back to the car. It wasn’t about the trial or my ego; I knew we weren’t going to be competitive and I was just happy to be running my little dog. 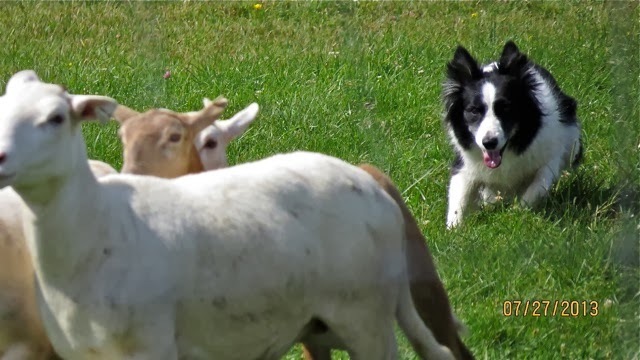 But the sadness was because I’d essentially just “punished” my dog in the most meaningful way possible for a working Border Collie; by taking her away from working the sheep, when she was trying to do the right thing. My only consolation (and it was small enough) was that the Novice Trials Committee decided to run Pro-Novice twice that day. She would at least be able to work again the same day, a few hours later. In the second trial of the day, Dare ran fifth in the running order, and Dot was near the end. I changed them both from sending left to sending right at Gene’s suggestion, but I can’t remember whether I sent right in the second trial or only in the third. Based on the scores, Dare’s outrun was quite a lot tighter in the second trial, and we struggled mightily on the drive, presumably missing the panels. We did make it to the pen, but of course did not get them in. O 16, L 7, F 11, D 5, Time. Total: 39. Dot and I had a very offline fetch and had more trouble on the drive, losing 10 points more than earlier in the day. Once again at the pen, I needed a small away flank, and she went come-bye, once again pushing the sheep away from the pen, and once again, never getting them to seriously reconsider going in the pen. It may not be “politically correct” to be annoyed by my dog, since she is, after all, only a dog, but I admit to my own weakness: this annoyed me heartily. She was cuing off my stock stick (which of course had to be where it was so I could cover the sheep on my side), and not listening to me. We’ve been working on this in training since the Novice Finals, and I suspect it’s something we will revisit frequently. O 20, L 7, F 13, D 14, Time. Total: 54. But wait, there’s still more Humble Pie to be served! The third Pro-Nov trial was run on Sunday. Dare was the first dog up on Sunday. I sent right to give her at least some chance to cover the side that the sheep were running towards. She was a bit tight, and a bit short on her lift. The fetch was way off line to the right, of course. She had to regather them two or three times getting them around the post and while on the drive leg. I give her a world of credit for stopping when I told her to (so very hard for her to let the running sheep get away) and collecting them off the fence. The last time they broke to the exhaust, they simply jumped out of the field into the exhaust pen. O 18, L 9, F 13, DQ. I forgot my camera on Saturday, so unfortunately I only have photos of our last, short runs on Sunday. All photos from the NEBCA Novice Finals by Regina Ireland-Auer. Dare heads off on her outrun. Dare trying hard to cover, but missing the fetch panels well to the right. Dare regathering and bringing them back to the drive line after their second or third escape. The final escape. Yes, she is clearly in the wrong spot to cover. I struggled to get it right, between my own lack of sheep sense, and the near-impossibility of being precise with Dare. Dot’s last run was a bit more than midway through the running order. A last chance to redeem ourselves! The dogs had had a considerable amount of crate time in the last two days, so several dogs before Dot’s run, I tried to warm her up a bit by gently throwing a toy for her to fetch. She enjoys toys, but is not mad for them, so I had no concern that she’d overdo it. Yet on this day of all days, she went hard and fast after the toy, and took a hard somersaulting tumble when she got to it! My heart was in my mouth. She got up moving with a few little hops, but seemed to loosen up as she moved, and appeared to be moving normally. When our turn came, I sent her on a right hand outrun, and she went absurdly deep, nearly to the back fence. She turned in and then crept up on them very slowly, creeping up the entire way from where she’d turned in. I decided I’d better throw away my concern about losing points here and just try to get her to come up on the sheep so I wouldn’t burn up all my time just during the outwork. If I could get them around the course, I’d certainly need as much time as possible at the pen. It was all for naught. We completed the fetch, but as we turned the post, they broke and ran toward the exhaust. I sent her to the away side to cover, and very unusually for her, she went quite slowly. I couldn’t be sure if her earlier tumble was the reason, but I suspect it had something to do with it. The sheep stopped at the fence, Dot was on the fence as wide as she could be, and she walked in on them very nicely. They jumped the fence and our run was over. Heading to the post for our last chance at redemption. It appears that perhaps one leg of the tripod was not fully extended for this series of photos. The field was pretty level. Waiting for the sheep to settle. Trying to cover, but not happening. I don't remember whether we made the panels, but I don't think so as our fetch score was very low. Still, we had a lot of fiddling about at the bottom near the post, which surely cost a lot of points. Seamus in front, Dare and Bran second row, Dot in the rear. Goofing off at the end of summer.